Why we went: When I see a man and a woman hiking or climbing together, commonly the man is carrying a much larger pack than the woman. I used to look at these couples and bemoan to myself what a shame that it was that these women couldn't carry their fair share. 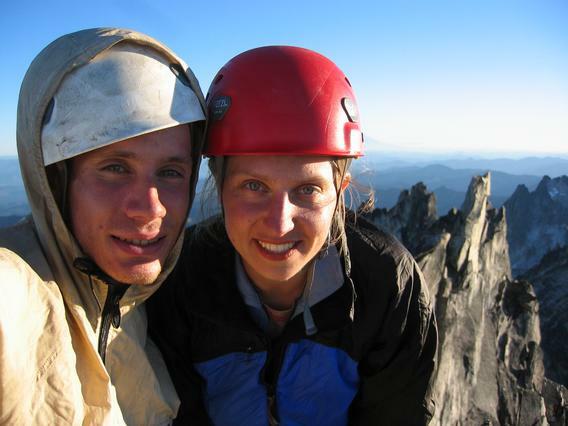 I always took pride in carrying half the gear and keeping up with my male climbing partners. Then one day I realized: It might actually be fun to carry less weight. Maybe these women were smart, not weak. I noted to several of my climbing partners that the way of the world should have them (the men) carrying the majority of the gear, but one by one they laughed in my face. Still, I had hopes. One day, Gary (who, mind you, had already laughed at me once) stopped by and I tossed out a thought. 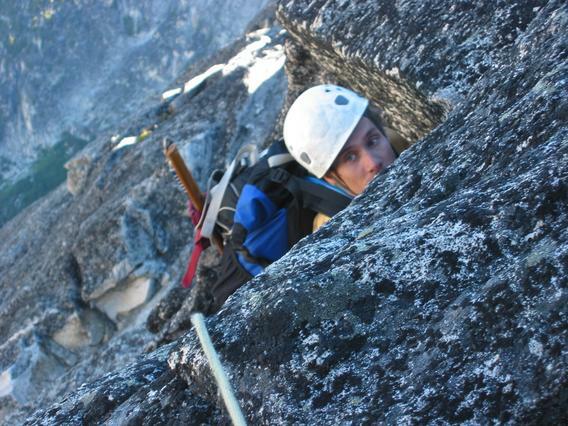 Surely, if I posted something on CascadeClimbers.com, some guy would volunteer to carry my gear, no? Yet, what trip would be low-risk enough that I'd be willing to go with any random bozo who answers my ad, yet nonetheless require enough gear for him to have weight to shlep? To my great excitement, Gary said: "Well you know, if there's some weekend when I can't find a climbing partner with a car, I'll carry your stuff for you." 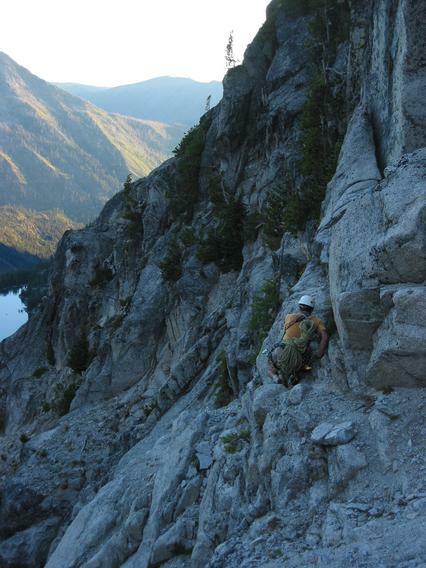 Where we went: Gary suggested the Backbone Ridge on Dragontail. I hadn't been climbing much for the previous 9 months but figured I still ought to be able to lead 5.9 face and Gary volunteered to lead the 5.9 offwidth. The rest of the pitches are rated easier. 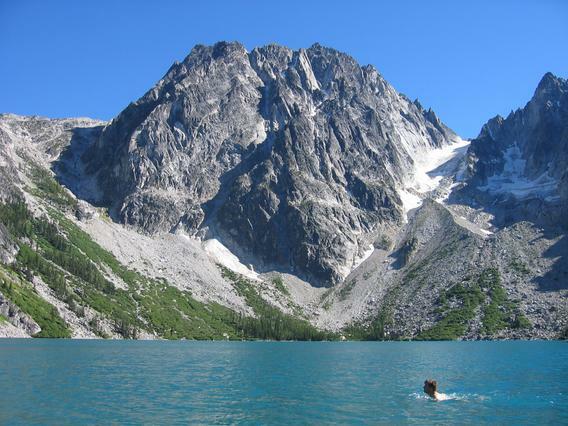 Gary swimming in Colchuck Lake, beneath Dragontail Peak. The approach: We drove to the Colchuck Lake trailhead on Saturday and hiked up in the early afternoon. It was a hot (for Seattle) day and Gary was feeling the heat with his big pack. 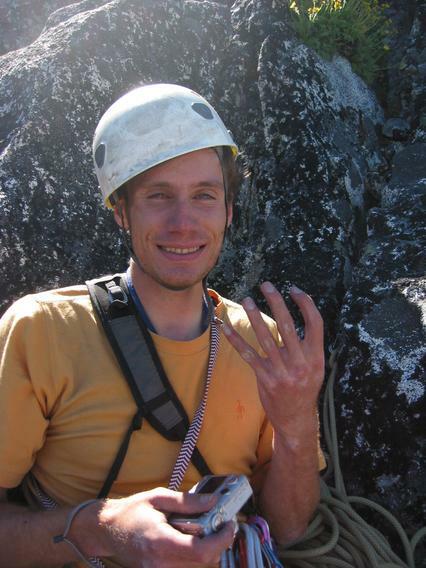 He had the rope, the rack including two monster big cams for the offwidth, dinner, all his personal gear, and a light tent. I had a sleeping bag, Thermarest, harness, shoes, and snacks for the next day. Wonderfully light! As I watched Gary sweating under the heat and the huge pack, I had the guilty thought that perhaps I ought to offer to carry some of the weight anyway. I decided that that wasn't the point of the trip, that Gary had known what he was getting into, and let the guilt quickly dissipate so I could enjoy the pleasant walk in the woods. 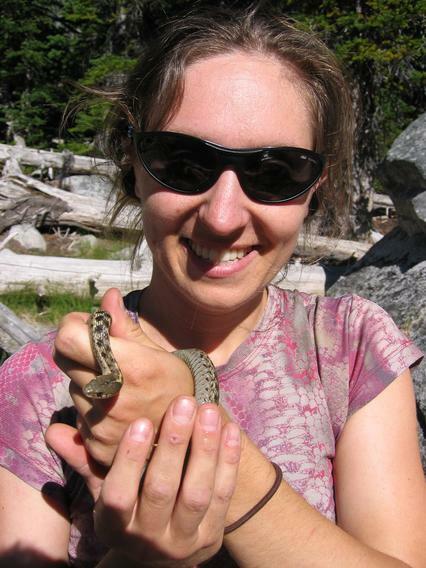 I was pretty excited to find and catch a garter snake. 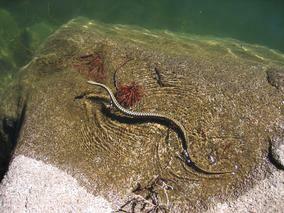 There was a pair hiding near a rock by the water. With Gary's help in cornering the snake, I gleefully caught it. Then, I spent the next half hour scrubbing my hands with lake sand and pine branches in hopes of removing the snake odor from my hands. Dinner: We enjoyed a wonderful dinner of burritos with fresh veggies and wine, in typical Ania and Gary style. Who says you can't eat well in the mountains, especially when you've got a sherpa? 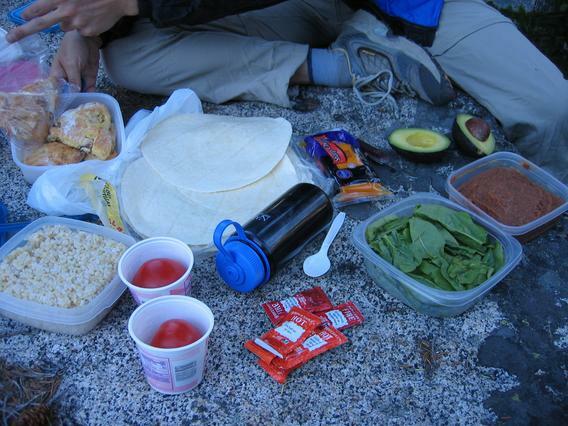 Scones baked that morning, tortillas, cheddar, organic avocado, refried beans, organic spinach, Taco Bell hot sauce, organic tomatoes, brown rice, Nalgene of red wine. Sunday morning, we got up before dawn. 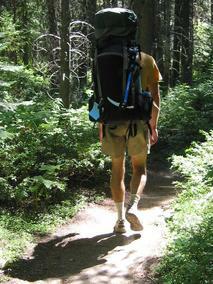 As we marched away from camp, I was disappointed to find that my pack got heavier on summit day. What kind of a sherpa was this anyway? Oh, yeah, the kind that would let me lead half the pitches, including the most beautiful pitch of the climb: the 5.9 face high on the fin. The trail took us to the talus, then across a short section of snow. Note: Montrail running shoes have more traction than beat up old sneakers. That put on on some scrambly terrain where I -- as usual -- pondered the distinction between 3rd class and 4th class. We scrambled left of the snow patch, then up and slightly right. The way was fairly clear, but we'd scouted it out from below earlier and taken note that we needed to stay on the light colored rock and not go too far left onto the dark rock. Pitch 1: I (Ania) lead the first pitch, 5.6 or so. It put us on the crest of the backbone ridge, right where we wanted to be. 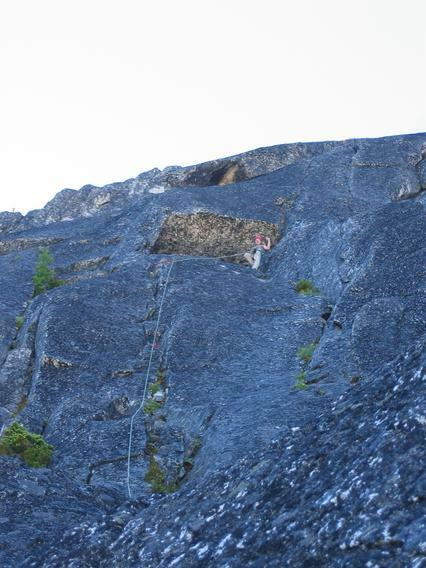 The route description said the offwidth was right of the crest so Gary lead a meandering half-pitch right to investigate what looked like an offwidth, then returned left and finally found the offwidth 20ft directly above my belay. 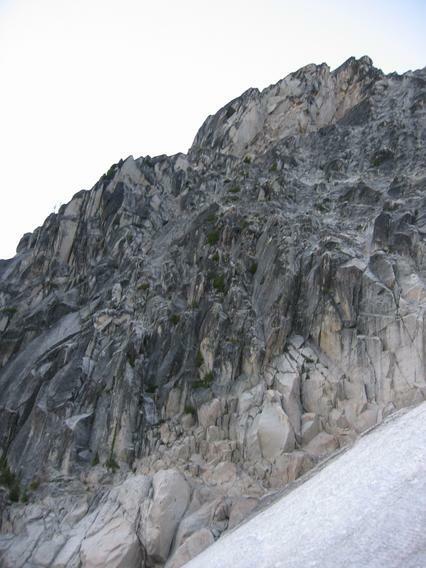 Looking up from anchor atop pitch 1, to the offwidth. The tiny yellow dot left of the big bush is Gary at the beginning of the offwidth. Pitch 2: Gary lead the offwidth. He had brought monster red and green DMM cams to protect it. I followed, first with the pack on my back and later choosing to trail it behind me. I've never worked this hard on a pitch before (and mind you, I've climbed 5.11). I'd grunt and heave and ho and push and squirm and breathe to find myself 6 inches higher. I named this pitch the Goodness Gracious pitch. I can't say that I climbed it cleanly only because associating the word "clean" with "offwidth" is pure sin. Pitch 3: Ania lead. The exact line wasn't clear but it was all easy. Then I spotted a beautiful little roof. 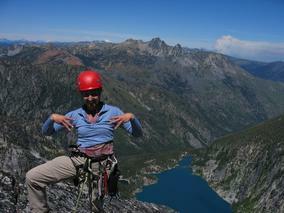 So I gleefully climbed it. Gary looking for the one move on the one-move-roof. Pitch 4: Gary lead. Mountaineering is a serious business. Glee and disregard for the correct route is punished. My choice to go over the roof put us on a line that included a shorter but meaner offwidth on pitch 4. It was overhanging. While Gary could find some large fist jams, with my smaller hands I said "pfft" and made plentiful use of the portable red handhold by DMM. No one should have to do offwidth if they can cheat. Offwidth is gross. Pitch 5: Ania lead. More ok but rather non-descript rock, including a very brief section of MORE offwidth. Pitch 7: Ania lead. 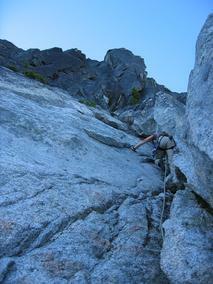 The terrain flattened somewhat so we simul-climbed the latter part of this long easy pitch. This put us at the base of the fin. Ania atop pitch 6, with forest fire plume visible in the background. 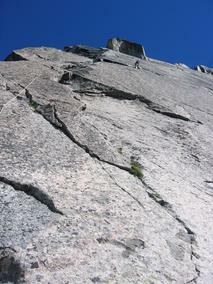 Pitch 8: Gary lead up to a big ledge. 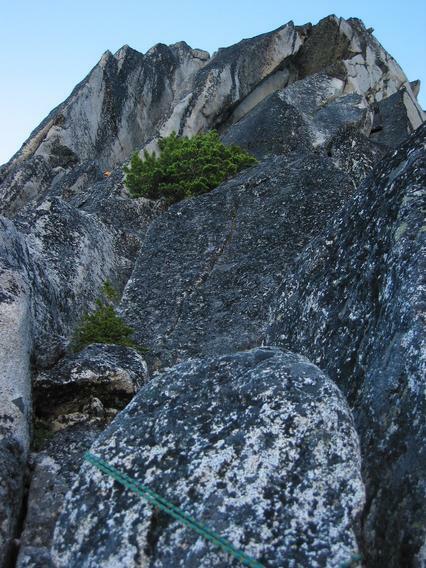 He dropped the topo early into the lead and it landed on a ledge some 6ft below my belay. I wanted to leave enough slack in the rope to downclimb and retrieve the map, once Gary reached then next anchor. "Ania, can I have 5 more ft?" I shifted upwards. "5ft more?" I sat above the anchor. "Just 5 more feet?" I stretched the anchor and shifted up as much as a I could. "Thanks!" When the "off-belay" came, I untied, clipped the rope to the anchor, and used runners to remain anchored as I descended now-15ft to retrieve the topo. Ania traversing the horizontal crack on pitch 9. Pitch 9: This pitch may be the most solid and elegant piece of alpine rock I've ever climbed. 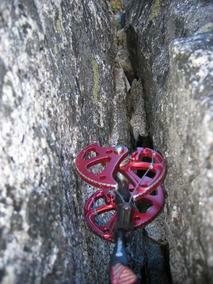 Face climbing follows a crack for protection. 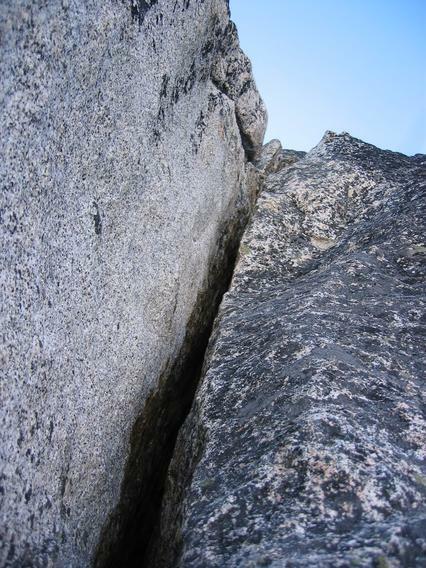 Then a deep horizontal crack provides solid footholds for a rightward traverse, with only palming for the hands. This rightward zig is followed by a zag as, in similar fashion, I walked and palmed along a diagonal up-and-left slanting crack. 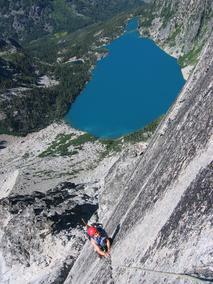 The top of the pitch put me on a fin narrow enough to straddle. 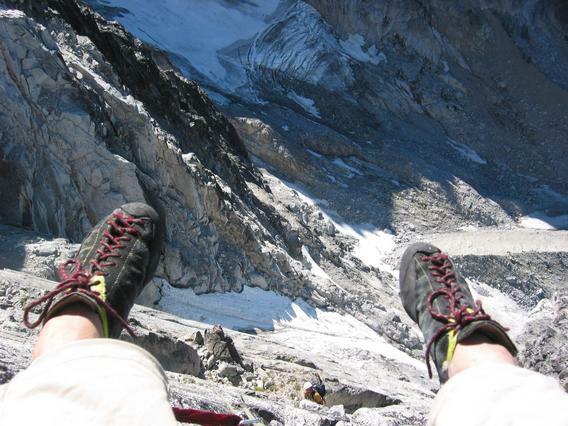 The flat seat was large enough for me and my pack, with just enough pro for an anchor. 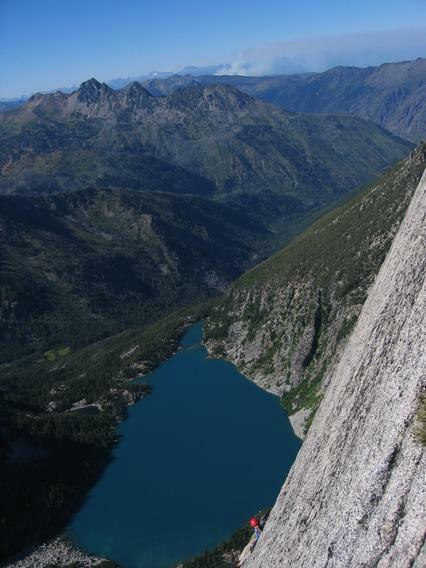 I sat sideways, dangling my feet over the 1500ft of space above the route, and with my back to a 500ft gulley on the other side of the fin. 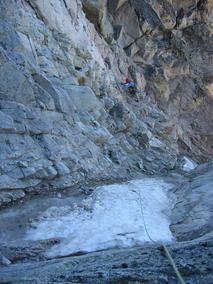 Ania looking down from top of pitch 9. Gary starting to lead pitch 10. Pitch 10: Gary lead the next pitch, a 5.7 crack similar to the previous 5.9 crack. 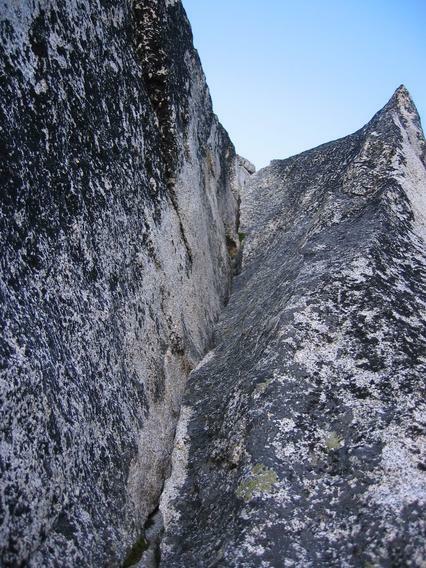 I walked with my feet solidly in the slanting crack, but able to lean down and use the crack for my hands as well. 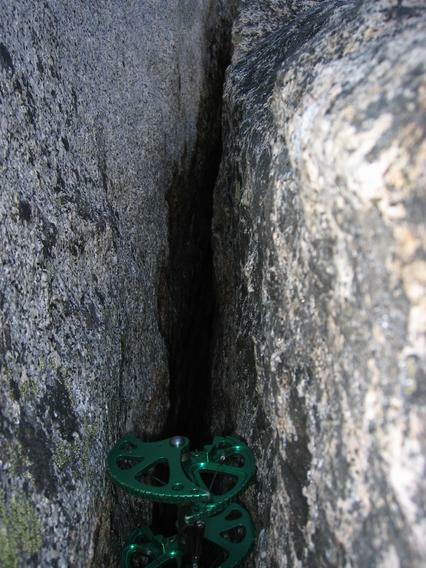 Pitch 11: The nastiest, loosest gulley I've ever climbed. Looking towards the summit, we had three options. On our right was a steep featureless face which we discarded as too difficult. Straight up were large blocks that looked climbable but questionably stable, possibly hard, and possibly difficult to protect. On our left was a short gulley. I dropped left into the gulley. Without exaggeration, three out of every four holds I tried would break off. I was glad Gary was a little above the gulley proper. The lead was an exercise in digging for solid rock, continually sending rock tumbling below me. 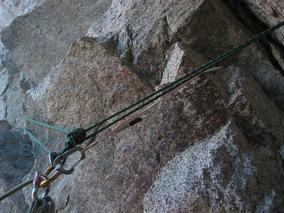 As I neared the end of the rope, I simply couldn't find any rock solid enough for an anchor along the gulley proper. I veered up and right into a 30ft dead end at whose terminus I finally found a maybe-ok flake and two solid gear placements. I breathed a sigh of relief and positioned myself carefully so I wouldn't dislodge rocks onto Gary as I belayed. Pitch 12: Gary followed to the mouth of the dead end. 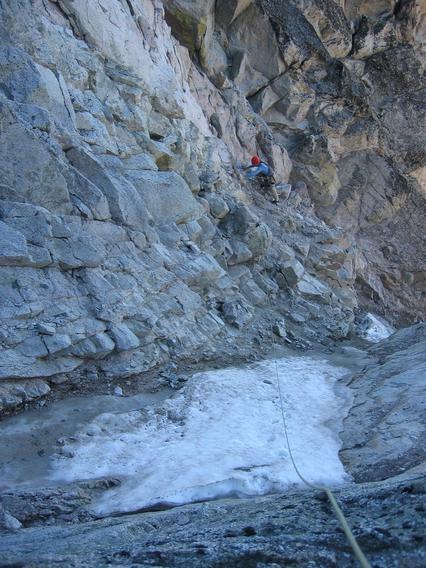 I slid some gear down the rope to him and he continued up the gulley proper. I was glad to be off on the side and not in his bowling alley. He set an intermediate anchor due to rope drag out the mouth of the dead end. I followed. He lead the last remnants of the gulley. We were done with the climb. 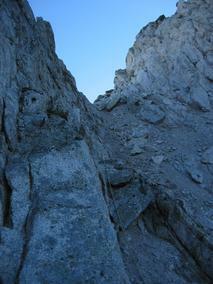 Looking up the last of the loose gulley. Gary and Ania on the summit. 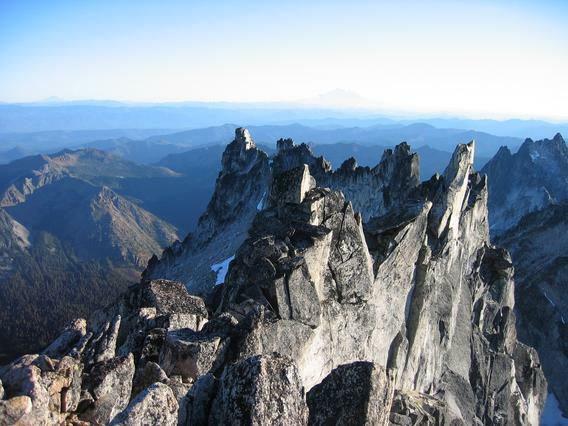 We left the pack, rope, and rack and scrambled onto the summit. The views were amazing, as one would expect at 7:30pm. 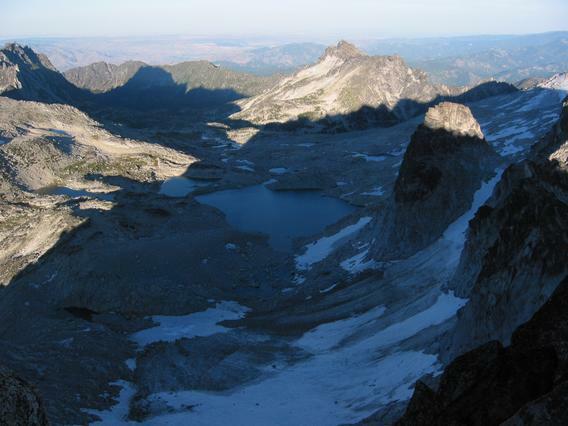 We descended without incident down the rocks and snowfield facing the Enchantments, and then down Asgaard Pass. We reached our campsite shortly after dark. We promptly ate, packed, and headed on down the trail. We reached the car just before 2am. I had this notion that I could drive home to Seattle, since Gary had a morning flight to catch. Half an hour later, when it was obvious that I wouldn't stay awake all the way home, especially with my passenger out cold, I pulled over at a rest stop and slept 3 hours. We woke up around dawn and arrived in front of Gary's apartment about half an hour before his flight's scheduled departure. Thankfully, the airline let him take a later flight that day. 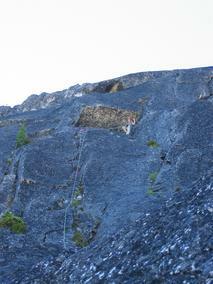 5.9 offwidth. Gary's lead. Ania commented: "Goodness gracious, I've never worked so hard on a single pitch. ?? Ania's lead. Optional roof was fun. ?? Gary's lead. Payback for choosing an alternate line over the roof. This pitch had a stretch of overhanging offwidth. Ania said "pfft" and made plentiful use of the red portable handhold by DMM. No one should have to do offwidth if they can cheat. Offwidth is gross. Ania's lead. With a few feet of offwidth. ?? Ania's lead. 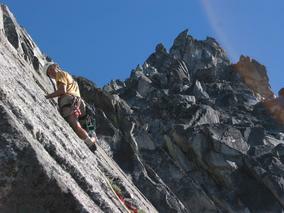 Long simul pitch over easy terrain. ?? Gary's lead. Up to a big ledge. 5.9 face. Ania's lead. Gorgeous rock. Belay at top on narrow but solid fin with a 1500ft dropoff on one side, and 500ft dropoff on the other. 5.7 face. Gary's lead. Finish off the beautiful face. ?? Ania's lead. Nasty loose gulley. Belay from a 30ft dead end because no rock in the gulley was solid enough for an anchor. This turned out to be a fortuitous place for an anchor, however, since it kept Ania out of the bowling alley beneath Gary as he lead further. ?? Gary's lead. Finish the gulley in two short pitches.